Downtown meets uptown! An authentic neighbourhood where from early in the morning until late at night wholesalers are hard at work. We saw many (fresh and fake) flower shops here. 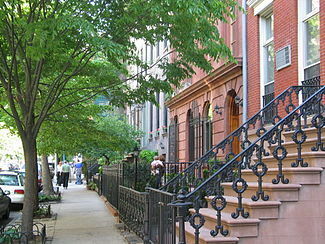 Chelsea has a lot of townhouses (think Cosbyshow) and beautifull wharehouses that have been transformed into trendy lofts in cobblestones streets. If you are into art then you’ll love Chelsea, there are so many artgalleries here. We like Chelsea a lot, somehow this is the real New York to us. We stayed at the Hilton Garden Inn. A good hotel on the outside of Chelsea. With a fabulous pizzaplace in the neighbourhood where pizzas are made "from scratch" and baked in a traditional oven. Take away? Yes! Great to eat at home, well, in your hotelroom, with a beer to wash it down. And tomorrow we'll eat “healthy and hip” again…. Chelsea is fun. For sure if you’re a night owl. The best nightclubs are in Chelsea. They can be hard to get into without cueing, but perhaps you can sign up with Chelsea nightclub tour? Apart from nighclubs, bars (also some good gay-friendly bars we were told) there are also plenty of restaurants. You don’t need to make any reservations; there’s always another good spot in the area where you can get a table. Except for some places, there you need to be in extreme luck to get a table without having made a reservation a couple of weeks in advance. Buddakan is an example. An absolute hit and it has been for long. If you like modern Asian cuisine and you’re in for a night of downtown chic, fun & hip, you know where to go. Shopping in Chelsea is good aswell. But feel like something entirely different? Go bowl, skate, play some soccer (“daily open soccer sessions”) or hit golfballs in the Hudsonat Chelseapiers. Daphne did that and had great fun! Very nearby is Meatpacking District, one of our favourite neighboorhoods as well.